With the prevalence of mobile devices, video content is becoming more and more popular every year. With these benefits, effective content management strategy should definitely include video content. ● Facebook allows videos up to two hours in length. ● Consider horizontal for desktop viewing and square and vertical videos tooptimise for mobile scrolling. ● Twitter allows videos from one to 140 seconds long. ● Instagram allows videos between three and 60 seconds long. ● SnapChat allows videos to be ten seconds long and they only last for 24 hours. 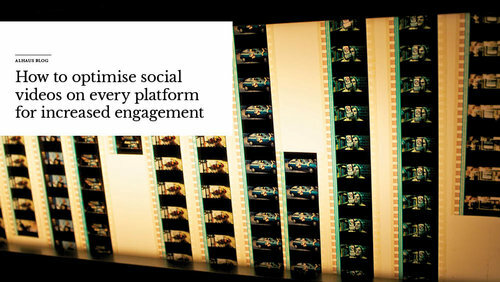 Optimising your videos is just one piece of creating video content for social media. You’ll also need to define your goals, brainstorm your content, and measure your results (TenFold). At ALHAUS we can help with all of these things. We offer a wide variety of content management services to ensure your social media strategy works for you. Reach out to our friendly customer service representatives to learn more!